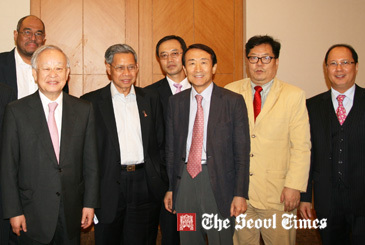 Dato' Sri Mustapa Mohamed (center), Malaysia's minister of international trade and industry, attends its investment seminar with other participants held in Seoul on July 16, 2012.
at Lotte Hotel in downtown Seoul on July 16, 2012. "South Korea is a very successful country particularly in manufacturing and IT technology"
The Malaysian investment seminar "Business Opportunities in Malaysia" started at 10 a.m. on the day drew hundreds of local businesspeople. In the opening speech Mr. Mohamed, minister of international trade and industry, urged for the South Korean businesses and its businesspeople to invest in his country. 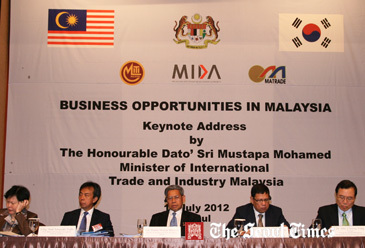 "South Korea is the second largest investor in Malaysia only after Japan," Minister Mohamed said. "South Korea is very important to Malaysia"
In the past three years Minister Mohamed visited South Korea seven years, seeking investment and economic cooperation between the two countries. He said that Malaysia's prime minister visited South Korea in 2011 following President Lee Myung-Bak's visit to Malaysia in the previous year. "Now the two nations are enjoying very close bilateral ties," Mr. Mohamed stressed the growing relations between Malaysia and South Korea. During his speech Mr. Mohamed gave all the credit for Malaysia's economic development to its "Look East" policy, which was initiated by Dr. Mahathir Mohamad, former prime minister. "Back in 1960s Malaysia started its economic development based on the labour-intensive and export-oriented economy," he said. “Now in the year 2010 Malaysia pursues high-income economy"
"Presently 22,000 Koreans are living in Malaysia," Mr. Mohamed stressed its strong ties with South Korea. "It is one of the largest overseas Korean community in Southeast Asia"
He said that the bilateral trade volume is 16 billion US dollars. Mr. Mohamed also emphasized Malaysia's geopolitical advantages. "Malaysia is the gateway to regional market," he said. 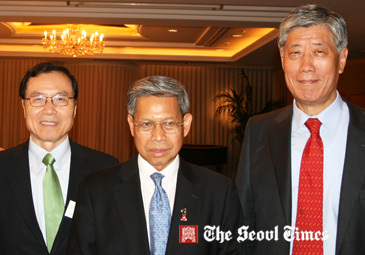 "It is in the very heart of Southeast Asia"
Dato' Sri Mustapa Mohamed (center), Malaysia's minister of international trade and industry, poses with other participants in its investment seminar held in Seoul on July 16, 2012. Malaysia, one of the founding member of the 10-state Association of Southeast Asian Nations (ASEAN), has signed an free trade agreement (FTA) in 2005 through the frame of ASEAN. ASEAN, with a combined GDP of 1.8 trillion US dollars as of 2010, has FTA agreements with Japan, China, Indonesia, New Zealand, Australia, and Chile. ASEAN is now gearing up for signing FTA with EU and Turkey as well. The trade minister introduced such South Korean companies as Samsung, LG, and SK Telecom operating in Malaysia. He mentioned about the incentives about doing business in Malaysia, which include investment tax allowance and exemption of other related tariffs and taxes. 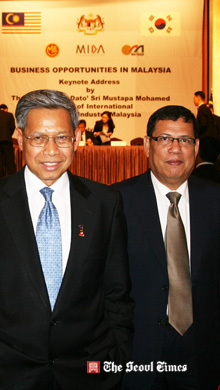 Dato' Sri Mustapa Mohamed (left), Malaysia's minister of international trade and industry, poses with Dato Ramlan Ibrahim, Malaysian ambassador to Seoul at the investment seminar held in Seoul on July 16, 2012. "Malaysia is the world's 10th most attractive destination for FDI (foreign direct investment)," he said. "And we have 30 international schools"
Roughly 4,000 international corporations from some 50 countries are now operating in Malaysia. Among them are a total of 116 South Korean companies. Mr. Mohamed also emphasized other aspects of Malaysia. "Malaysia is golfer's dream," he said. "There are some 170 golf courses"
Malaysia permits direct foreign ownership of real estate. "Kuala Lumpur is one of the top 20 most liveable cities around the world," he added. Tourism is also a big industry in relations to South Korea in particular. In the year 2011 a total of 263,425 South Koreans visited the Southeast Asian country, making Malaysia one of the most favoured tourist destinations for the Koreans. "South Korea is No. 2 most important investor to Malaysia only after Japan," he said. "South Korea is fast growing and it has a lot of potentials"
Dato' Sri Mustapa Mohamed (3rd from left), Malaysia's minister of international trade and industry, poses with, Chairman Sohn Kyung-Shik (2nd from left) of the Korea Chamber of Commerce & Industry (KCCI), and ex-Construction Minister Lee Hwan-Kyun (3rd from right), and with others at the investment seminar held in Seoul on July 16, 2012. Mr. Mohamed business delegation is composed of other Malaysian government officials including Dr. Wong Lai Sum,chief executive officer of Matrade (Malaysia Extgernal Trade Development Corporation) and numerous Malaysian businesspeople. The seminar was co-hosted by Malaysia’s Ministry of International Trade and Industry (MIDA) and Malaysia External Trade Development Corporation (Matrade), the national export promotion agency of Malaysia. For details or participation call 733-6130-1 or leave Emails at midasel@chollian.net no later than July 13, 2012.